Well guys and gals.. It's been a long and bloody battle but I've finally got the bike back up and running! Let me apologise before hand for my some what long time between posts. Been busy as on the farm and weeping over the hot sunny days and the parked up bike. I will recount my story tho some already know the beginning. 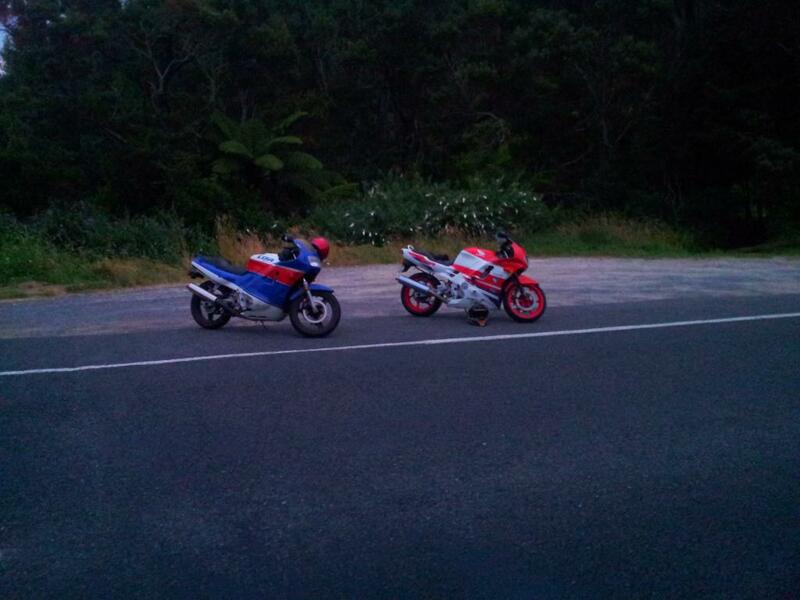 Around September last year a mate and I "tested" our bikes. While I was impressed I hit the needle with ease the bike was not! The ride home was a loose ride but due to ice grit in the ranges I thought this was the cause, (September is end of winter here) but alas it was not. I can now confirm it was the internal seal in the water-pump thus causing the engine oil to leak into the cooling system which then came out the overflow of the reservoir, and all over my rear tyre. See my other posts for pics of the hunky brown sludge. So I place a post on this wondrous and bike savingly awesome site asking for advice and I sure got it... Thanks guys. HURT... 4 months later I finally got one from GP auto dismantles in Katikati NZ. A new one was just over $450.00 and I couldn't guarantee it was even the issue so opted to hunt for a cheaper second hand one. As it was the new one was up to 8 weeks delivery so thought no worries. Well I couldn't be more wrong. F2 parts in NZ are getting hard to find I can testify your honours. I was over the moon when last week I found the elusive water pump. I had it on the door the next day and in the bike that evening and was test riding it at dusk. Noticed coolant on the road in the photo below of our dusk test ride so pulled apart and rad was out and at the rad repair shop by 8.15 am the next morning. I had it wielded and in my hands by 4pm and back in the bike after dinner. Oil in motor clean... Check. So happy I could have cried....but I didn't!! So today off to Honda for a new rear tyre as the old one had maybe 1-2mm at best. Had a quick ride after work and wow I remember now why I loved this bike so much. Anyway she's all going and I still have a few months of summer left. Here's a few pics of my test rides. "Jelly mould" was the original Ford Sierra's. 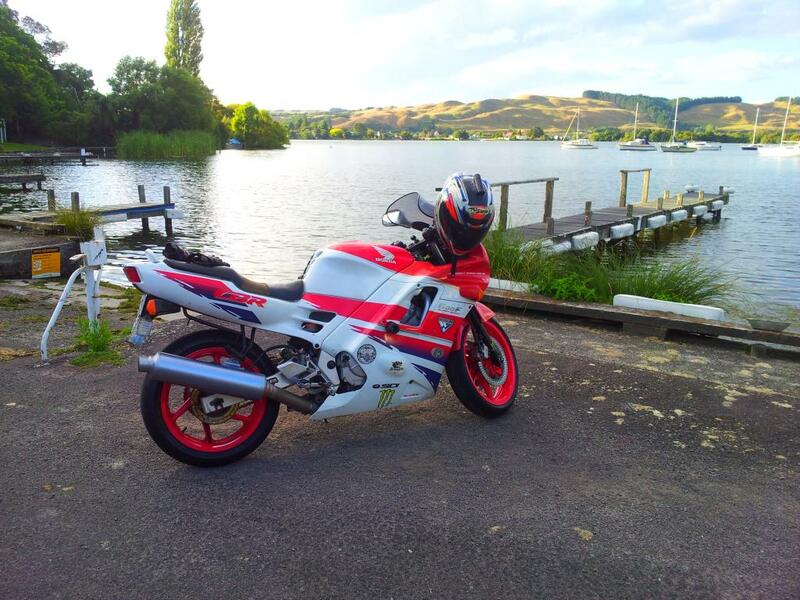 I think you should give more respect to your mates, nearly 30 year old bike. "And so it was born, the “jelly mould” CBR600 of 1987, not everyone was a fan of the styling but I just simply loved that full enclosure bodywork back then." So TK how's you hurricane been treating you this summer? Hope work has allowed you some time off to enjoy the stunning South Island. 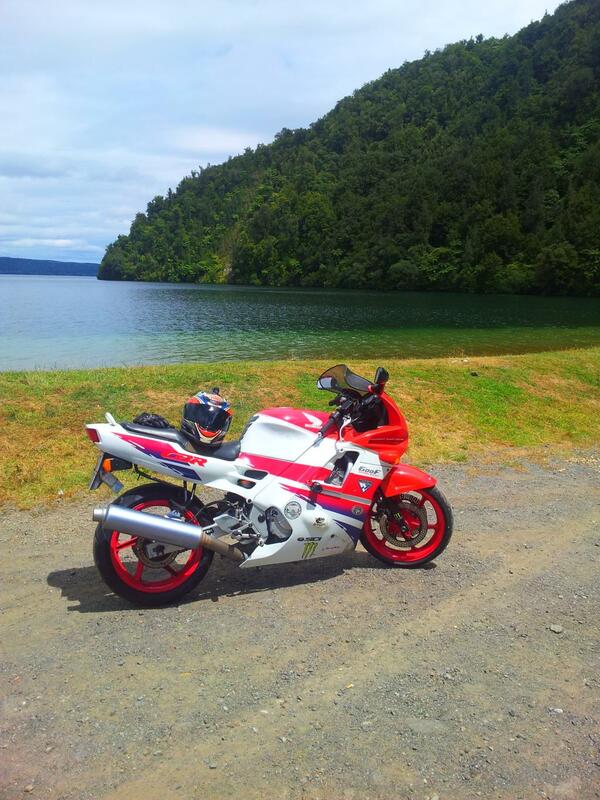 Btw my mate and I will have our bikes down your way in November so will be hitting you up for some recommended roads to get the most out of our trip down to mordor. Keep em wheels a rolling while we wait for our turn up here! 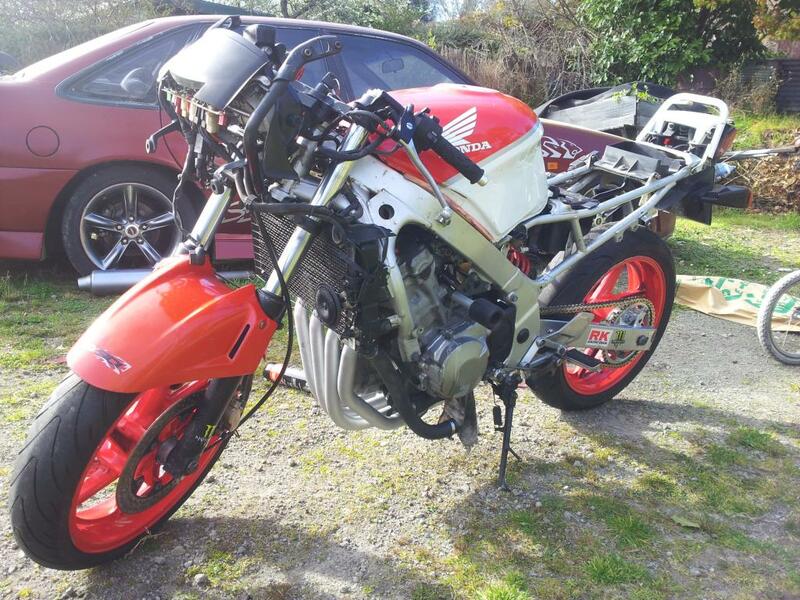 Met an old school mate the other day, turns out he's a member of the central north island triumph club. He was the guy who put me onto the supplier whom I got my water pump from. On the 7th of February we are off on a run to a beach house with about 20plus other bikes so should have many great pics to post of trumpies, vintage to modern and custom. I'm looking forward to a few challenges too but if it's been quiet... Well. I'm off to hit the fart sack. Haven't ridden in ages! AAAHHHHH!!! This is the funniest thing I've watched in ages! Alright we have the Ages Now lets get some pics.